Makeup primer is designed to make makeup stay in place, on your skin, throughout the day. Smashbox Photo Finish Foundation Primer does this and more, by smoothing the skin, eliminating fine lines and hiding imperfections. Like paint primers, foundation primer is the base for other makeup to go on top of. Foundation primers are applied after you wash your face, before you apply any other makeup. Original . This is a basic primer, colorless and odorless. Light . Also colorless, but has an even lighter application. Good if you have light acne scarring or fine lines on your face. SPF 15 . A light apricot shade, but dries clear on the skin. Color Adjust Green - minimizes redness. This is the primer I use. It evens out my skin tone, but it doesn't leave any green tone––it goes on clear. Color Balance Lavender - for people with yellow or sallow skintones, to bring more color and brightness into the complexion. Color Blend Apricot - for concealing dark circles, veins, sunspots and more. Bronzing Primer - does what it says it does. Don't be put off by the color, which is a very dark brown; it looks much lighter on your skin. Maybe not a good shade for very fair people, though. I use Smashbox foundation primer because it goes on very easily, it blends to a nice consistency and, once you put it on, you don't feel anything. I dislike the feeling of wearing heavy makeup––it feels like wearing peanut butter on my face. This is therefore a good fit for me. This is not a product for everybody. "Watch out acne prone ladies," lulubird wrote on Meg's Makeup Reviews, "I became a bit too oily in my oily spots. Because my face got very finicky with this pricy product I would not buy it again." A reviewer on Sephora commented, "[This] primer...feels nice on my skin and makes makeup application easy, but it does not keep it on for much longer or keep my face less oily. Probably not worth $36 for only 1oz." 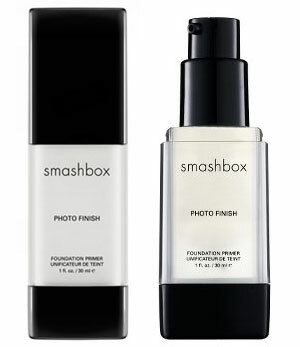 They're right about the price; Smashbox Cosmetics is a high-end makeup brand, and this primer costs $36 per bottle. At Sephora, you can get travel-sized bottles of primer which cost $16. You can also buy these, online, at Amazon.com .